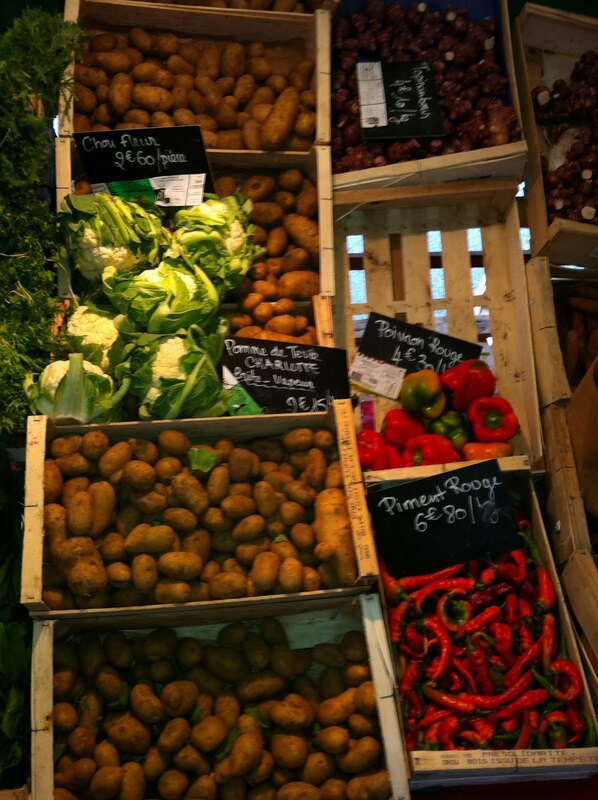 Just in time for the weekend, this Marché of the Month is all about Marché Raspail! 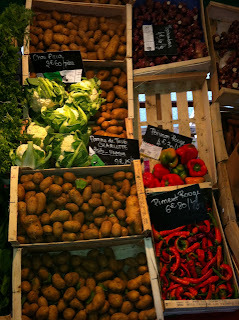 This all-organic market is the largest of it's kind in Paris, and possibly France (according to a vendor I overheard while shopping). I couldn't wait to stop by ever since TERResA recommended it to me during our interview (Day 28), and I certainly wasn't dissapointed after I made the trek from the 18th all the way to the 6th. The vegetables are obviously organic and garden-fresh, as they are displayed in their straight-from-the-farm wooden crates and are perfectly imperfect and dirt-coated. 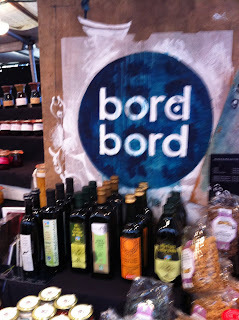 The market boasts certain claims to fame, like the fresh squeezed juice stand (carrot and wheatgrass, about 2 euro a glass), the fresh oyster stand, and the bord à bord booth, where you can buy home made pasta along with their famous fresh butter- either au natural or with super healthy seaweeds. I bought they're seaweed butter and Tartare aux Algues, and savored the Omega-3 algae explosion that took place in my mouth when I got home later that day. Other items I found included fresh (delicious!!) little cucumbers sold by a woman who also makes her own camembert (I had to pick some of that up, as well)! Then I headed over to c'bio and picked up some fresh dill, which was wrapped up like a little flower bouquet by the lovely vendor, who also asked kindly if I were enjoying the hot-off-the-griddle chick pea pancake with basil sauce that I was devouring as I did my shopping. The market is also a great place to grab lunch, there are many options including a wide variety of hot soups, galettes of all kinds, and easy to-go options like little cartons of grated carrots and mashed potatoes, along with main dishes, as well. After an hour of walking around, my hands were getting full, but I couldn't help picking up a bottle of farm fresh apple juice on my way out, I had spent every last cent in my wallet so it was finally time to go, but I was happy with the treasures I was taking home! As we speak, my lovely cucumbers are chillin' and dillin' getting all pickely and briney and ready to eat! It is clear that discoveries made at the Marché Raspail long out-live any shelf date, and I think that once you visit, it will become a regular part of your weekend schedule- so don't put it off any longer!